During the days of Holy Week, the Church offers us, every year, an opportunity to enter more deeply into the Paschal Mystery — the suffering, death and resurrection of Christ — by which we have been saved from the power of sin and given a new life of grace. Commenting on this passage, Pope St. John Paul II said that this Pauline hymn reflects how the Word of God takes on “the reality and condition of a servant … in order to enter the horizon of human history,” yet, “from below it ascends to the heights, from humiliation it rises towards exaltation” (General Audience, Aug. 4, 2004). Throughout the liturgies of Holy Week, we encounter and accompany this God who empties himself in order to exalt us. The Sacred Paschal Triduum, “the high point of the entire liturgical year,” begins on Holy Thursday with the evening Mass of the Lord’s Supper (Universal Norms on the Liturgical Year and the Calendar, 18). At this Mass, the Church commemorates the Lord’s institution of the Eucharist and the priesthood. Just as Christ washed the feet of his disciples at the Last Supper, so, too, at this Mass does the priest wash the feet of his people. In this symbolic act, we are able to see the divine self-emptying that fills us with grace through the Eucharist and the priesthood. Pope Benedict XVI wrote, “[Christ] divests himself of his divine splendor; he, as it were, kneels down before us; he washes and dries our soiled feet, in order to make us fit to sit at table for God’s wedding feast” (Jesus of Nazareth, vol. 2, 57). Indeed, he continues even today to set aside his glory in order to draw close to us and give himself to us, choosing frail and flawed men to be the ministers of his grace and entering into our midst under the simple and humble appearance of bread and wine. On Good Friday, the Church solemnly remembers the Lord’s passion and death upon the cross. During the liturgy on this day, the altars are stripped of all decoration, the tabernacles lie empty, and the priest enters in silence and prostrates himself before the altar. We enter with Christ into the complete abasement and degradation of the cross, in which is stripped away not only his divine splendor, but even the last vestiges of the human dignity he had taken to himself. And yet, within the same liturgy, the priest raises up the Cross for the veneration of the faithful, acclaiming it with the words, “Behold the wood of the Cross, on which hung the salvation of the world.” We recognize that in Jesus’ loving obedience to the Father all the way to the end, creation has at last fulfilled its destiny in union with its creator and thus is exalted and redeemed upon the Cross in the complete self-offering of Christ. On Holy Saturday, the Church waits in silence while the Lord lies buried in the tomb. But on that night, during the Easter Vigil, the darkness is pierced by the light of Christ, represented by the Paschal Candle, and the silence is broken by pealing bells and jubilant hymns of praise: the Exsultet, the Gloria, the Alleluia. From the suffering and humiliation of the Cross, and from the stillness and finality of the grave, Christ rises victorious over the powers of sin and death. But he does not return from his descent alone. He has assumed all of mankind to himself and he does not now leave aside his humanity, but rather raises it up with him to the heights of heaven, to a new life with God. During the Masses of Easter, we remember that the victory won by Christ through his sacrifice has opened up a new life for us, which we receive through the saving waters of baptism. During Holy Week, we encounter again and again the God who stoops down to us in order to lift us up to himself. He empties himself to fill us; he strips away his glory to exalt us. He loves us to the end. As we enter into these sacred days, let us follow his example of humility and allow his divine love to fill us and raise us up to a new life of holiness and grace. Father Ryan L. Stenger, J.C.L., is pastor of St. Joseph Parish, Camp Springs. Jordan Hainsey is preparing for his ordination to the diaconate, which will take place at the Cathedral Basilica of the Assumption, Covington, April 13. In reality, Mr. Hainsey has been preparing for this for a long, long time. He is the only child of Raymond and Denise Hainsey and he says that his family has been the biggest influence on his journey toward priesthood. “I grew up ELCA Lutheran, very active in the church, but there was always a tug at my heart toward the Catholic Church,” he said. “I wasn’t your normal kid. As a child, I dragged my parents to Fatima devotions at the local Franciscan Monastery, watched EWTN for hours on end, and had an altar with all the accouterments in the family room. Likewise, my beloved grandma became a ‘vestment maker,’ sewing chasubles and copes. Mr. Hainsey says that he has very much enjoyed his studies and formation in seminary. He has attended both the Pontifical College Josephinum, Columbus, Ohio, and St. Vincent Seminary, Latrobe. He earned his bachelor’s degree in philosophy in 2017. Before entering the seminary Mr. Hainsey earned a bachelor’s degree in graphic design at St. Vincent College, a talent he continues to use often, but, he says, his journey in the seminary has brought him to a much more exciting place spiritually and with a deeper understanding of life. Following college Mr. Hainsey was working in public relations and graphic design at St. Vincent Archabbey and Seminary and that is where he developed friendships with seminarians from the Diocese of Covington. As a deacon, Mr. Hainsey is looking forward to being a servant to the people of God. Mr. Hainsey said that his favorite Bible passage is Romans 8:31–39, which speaks of the all-conquering power God’s love has at overcoming every obstacle to one’s salvation. In his spare time Mr. Hainsey enjoys hiking, kayaking and traveling, and he says that it is healthy and good to make time to go outside of one’s routine to experience nature and other cultures replete with their traditions. “These experiences of God’s creative handiwork and our connectedness to one another help me to re-center and grow closer to God,” he said. Another interesting fact about Mr. Hainsey is that he is involved with the cause of canonization of Blessed Karl of Austria (Kaiser Karl Gebetsliga), the last emperor of Austria-Hungary. In 2017, Mr. Hainsey was invited by the international delegation of the Gebetsliga to Rome to meet with Pope Francis on the centenary anniversary of the peace initiatives of Pope Benedict XV, a contemporary of Blessed Karl, who tried to avert the disaster of World War I. The Most Reverend Roger J. Foys, D.D. Focus on the Family in conjunction with local agencies and ministries, will be hosting free educational events on foster care, entitled “Wait No More,” later this year, Aug. 20–23, 2019, at four Kentucky locations. One of the locations will be in Northern Kentucky at Florence Baptist Church, Florence, on Aug. 20, at 6 p.m. Event planners are hoping to fill the exceptionally large church with hundreds and hundreds of people. The other three Kentucky events will take place in Lexington, Louisville and Bowling Green. The Wait No More events are designed to empower and educate people, encouraging families to consider fostering children, adopting children from foster care or supporting other families who do those two things. Architects of the program are making an appeal to the Christian community. They are hoping that churches all across Kentucky will spread the word about the event and invite their congregations to attend. In Kentucky there are more than 6,359 churches with families who can change the lives of these children forever. Over the past 10 years there have been 39 Wait No More events conducted in 22 states, and over 4,000 families have been inspired to help the foster care system, but this is just the tip of the iceberg. Right now there are more than 400,000 children and youth in foster care in the United States, 100,000 of whom are available for adoption and waiting for families to call their own. In Kentucky alone there are over 9,800 children in the foster care system waiting for families. They are children who have often times been through traumatic experiences or cases of abuse or neglect. In some cases they are children of parents who are addicted to opioids, or, even worse, parents who died from an overdose. Sometimes the children in foster care have been through all of that listed above and more. Ultimately, they are children who, for one reason or another, the state found necessary to move from a situation of danger to a place of safety. And so they wait. They wait in an overwhelmed system, and they wait for an undisclosed amount of time. They are young, ages varying from newborn to 17; they come in all shapes and sizes and from many different backgrounds. They didn’t ask to be foster children and they deserve families that will love, nurture, support, guide and advocate for them. But where will these families come from? In preparation for the main event in August, representatives from the Diocese of Covington — Ron Bertsch, director of therapeutic foster care/adoption services, and Natalie Hemmer, recruiter, for Diocesan Catholic Children’s Home (DCCH Center for Children and Families); and Deacon Paul Yancey, All Saints Parish, Walton, and assistant to the director, Permanent Deacon Formation — joined other church, government and community leaders at the Kentucky Community Leader dinner Feb. 26 at Florence Baptist Church. There they heard, Jim Daly, president and CEO of Focus on the Family, speak about his personal story as a foster child and about the mission of Wait No More. Mr. Daly said that after losing his parents at a young age he had many painful experiences but caught glimpses of grace throughout his journey, mostly through small acts of kindness from the people who entered his life by chance. Mr. Daly and his wife, Jean, became certified foster parents around 10 years ago and have taken care of over 15 children since that time. Mr. Daly said that one of the biggest challenges working in Christian ministry is how to motivate people to roll up their sleeves and get to work. “Our culture tells us to stick to our comfort and leisure, but that’s not what this life is about for us as Christians,” he said. Mr. Bertsch is hoping that many in the Catholic community will attend the Wait No More event in August. He said that he fears that foster care, to many people, seems like an unimaginable sacrifice and not something anyone in their right mind would do. Mr. Bertsch said that he doesn’t want children in Northern Kentucky to wait for a good family. “We need more Christian families to answer the call now and make a difference in a child’s life now,” he said. “I loved what was said Tuesday night (at the Kentucky Community Leader dinner): whether someone can foster a child for a season or parent for a lifetime, they can make a difference. We need more families to care for these children. Mr. Bertsch said that, along with praying for the foster and adoptive parents, there is so much more the people in the Catholic Church can do, aside from fostering and adopting children. “Some might be called to be shorter term respite providers. Others are maybe called to help with the multiple children in a foster or adoptive home, who need transportation to school events, practice or games. Maybe others could offer to make a meal after a long tough day for a family that was out on medical or therapy appointments. Find ways to help with school homework that is taking a toll on a family,” he said. Mr. Bertsch said that a good first step for people, no matter what God may be calling them to do, is to make plans to attend Wait No More and bring friends. Focus on the Family will present a free “Wait No More” foster care event at Florence Baptist Church, Florence, Aug. 20, 6 p.m. Since food will be provided, those interested are asked to register at WaitNoMore.org/KY. Diocesan Catholic Children’s Home (DCCH), Ft. Mitchell, informational meeting, March 14, Independence, Kenton Co. Public Library, 6:30 p.m.; and March 26, at DCCH, 6:30 p.m. DCCH staff are willing to meet with anyone individually, call 331–2040, ext. 8641. The next training program for foster parents will begin May 9. Each session is a 10-week training for three hours each night for a total of 30 hours pre-service training; this includes the Virtus, Protecting God’s Children class. Visit https://www.dcchcenter.org. Around 65 student representatives from five high schools and 12 elementary schools participated, Feb. 15, in the annual Catholic Relief Services (CRS) Operation Rice Bowl kickoff luncheon at Bishop Howard Memorial Auditorium, Covington. The local (CRS) Rice Bowl event is co-sponsored by Catholic Charities – Diocese of Covington and the diocesan Office of Stewardship and Mission Services. At the event the junior high and high school students learned about the popular CRS Rice Bowl Lenten project, local poverty and what local social service agencies are doing to face the challenges of the community. Catholic Relief Services is the official international humanitarian agency of the Catholic community in the United States. CRS Rice Bowl is Catholic Relief Services’ Lenten program for families and faith communities in the United States who want to put faith into action. Through CRS Rice Bowl, participants hear stories about people in need around the world, and devote Lenten prayers, fasting and alms to change the lives of those who suffer in poverty. As students and guests entered Bishop Howard Memorial Auditorium they were directed to three interactive displays created by students from St. Joseph Academy, Walton. The displays provided information about a few of the countries that CRS serves. The students who created the displays offered information about the countries and its greatest needs. During lunch students were assigned to specific tables with leaders representing one of several local agencies that assist the poor and marginalized in the area. The table leaders were: Andy Brunsman, executive director, Be Concerned; Vicky Bauerle, institutional advancement manager, Catholic Charities; Brandy Mendaugh, case manager of Catholic Charities’ St. Joseph Apartments; Benedictine Sister Cathy Bauer; Connor Creaghead, assessment and resource coordinator, Welcome House; Gina Cornelius, housing counselor, HONK; Jill Hilgefort, executive director, Faith Community Pharmacy; Karen Zengel, executive director, Society of St. Vincent de Paul; and Kim Webb, executive director, Emergency Shelter of Northern Kentucky. Each leader explained to the students how his or her organization serves the community. The students reflected on what they heard and brainstormed ways they could bring the information back to their schools, inspire other students and make a positive impact in the world. The CRS keynote speaker was Daniel Mumuni, program manager, McGovern-Dole Food for Education program, Sierra Leone. The McGovern-Dole Food for Education program provides food for children in school. In West Africa, many communities depend on agriculture for food and income. As a result, children commonly drop out of school to help parents farm the land to help make ends meet. While helping in the fields provides some support to the family, a child without an education faces long-term obstacles. Offering meals to children doesn’t just keep them in school, it also encourages parents to become more engaged and committed to improving their children’s education. Mr. Mumuni has witnessed this firsthand — parents have volunteered to upgrade school facilities by providing and transporting building materials. This is their way to show they believe in the importance of education, and to prove that they have the power to build their own futures. Mr. Mumuni shared his personal story of growing up in Ghana. He was lucky, he said, to have parents who believed in the value of a good education, who ensured that he and his siblings all had the best education possible despite the meager family resources. The fact that he was able to achieve a quality education in one of the most deprived regions of Ghana has shaped his worldview and is why he does what he does. As a father of two daughters he works hard to provide what is best for them and when he sees the poor and the most vulnerable, he always sees them through the eyes of his children and remembers from where he came. Sierra Leone, where Mr. Mumuni works, is still recovering from the civil war that raged between 1991 and 2002, that resulted in tens of thousands of deaths and the displacement of more than 2 million people (about a third of the population). Sierra Leone remains among the least developed countries in the world, ranking 183 out of 186 countries. Life expectancy is 48 years and youth unemployment is 70 percent. Rates of child and maternal mortality are high, levels of education are low and, despite rich resource endowments and abundant land, more than 60 percent of Sierra Leoneans live on less than $1.25 a day. Mr. Mumuni asked the students why they thought it was important for them to learn about other people living in poverty in other places around the world? He asked them how these stories connected to them or why they mattered at all? “Every day the children in Sierra Leone pray to God for support before they start school. They pray for better lives for their parents, for good health, for a good education, for a good future. But, what does that prayer mean? It is calling on God for help. How does God answer prayer? He answers through each of us. That is how God works. We are all vessels, instruments of God,” said Mr. Mumuni. Through CRS Rice Bowl, faith communities throughout the United States put their faith into action. Lenten alms donated through CRS Rice Bowl support the work of CRS in roughly 45 different countries each year. Twenty-five percent of all donations to CRS Rice Bowl stay in the local diocese, supporting hunger and poverty alleviation efforts. Since its inception in 1975, CRS Rice Bowl has raised nearly $300 million. More information and resources can be found at https://www.crsricebowl.org. Care Net, a Christ-centered organization whose mission is to educate, support and empower men and women before, during and after an unplanned pregnancy while uplifting the sanctity of human life, has expanded its medical services to include same-day ultrasound appointments. According to Lyndi Zembrodt, executive director, this new initiative may result in 41 percent more lives saved in 2019. While Care Net began offering ultrasounds at no cost to clients in 2006, they were only able to do so once a week. After adding a second pregnancy service center, they began rotating the weekly ultrasounds between their two medical facilities — Cold Spring and Florence (Care Net also has a third pregnancy service center in Williamstown, but it is not a medical clinic). Last month, January 2019, Care Net launched the new initiative, offering ultrasounds four days a week — each day they are open. There was a 110 percent increase in the number of ultrasounds they performed this year over last. “We are attracting more clients because they can get in for a same-day ultrasound. We have revamped our client website, to include a phone number for our 24-hour helpline they can call or they can book their appointment right there online. We have been able to get these women in here immediately,” said Mrs. Zembrodt. The reason these clients end up at Care Net, according to Mrs. Zembrodt, is because their website contains information about abortion and so it comes up in their online search. Mrs. Zembrodt said that the majority of Care Net’s clients are women who are considered abortion-vulnerable — women who may otherwise want to carry their baby to term but their circumstances, whether it be their job, an unstable relationship with the father of the baby or housing issues, lead them to believe that they are in a position where they can’t choose life. “We do everything we can think of that we feel will be meaningful for these young people to connect to these babies,” Mrs. Zembrodt said. Mrs. Zembrodt said that they track, to the best of their ability, the final decisions made by the people who come to see them. “Some of them we may know that they’ve have changed their mind during the ultrasound. We also follow up with a doctor’s report of the ultrasound findings with them, and we also, at that time, would like to know what their decision is in case it is our last contact with them,” she said. It has taken a giant leap of faith for Care Net to begin offering same-day ultrasounds. According to Mrs. Zembrodt, having a place like Care Net and supporting grass root pregnancy care centers is a crucial component of the pro-life movement. “Laws can change in a minute — we’ve seen that recently with the state of New York — and it’s important to have pregnancy resource centers that are impacting the lives of the people they see on a daily basis. We are changing the culture and having an impact because we are meeting people at a grass roots level and educating them on the sanctity of all human life,” she said. Care Net began operations in July 1999. All services are free and confidential. To find out more visit https://www.choselifenky.org or https://carenetnky.org. Bob Rowe, principal, opened with a prayer, then introduced Bishop Foys. Bishop Foys began by sharing how impressive the March for Life had been, especially the Mass celebrated at St. Dominic Church just before the march. “I know many of you couldn’t be at the Mass because you had a problem with your buses. It was really a moving time,” said Bishop Foys. 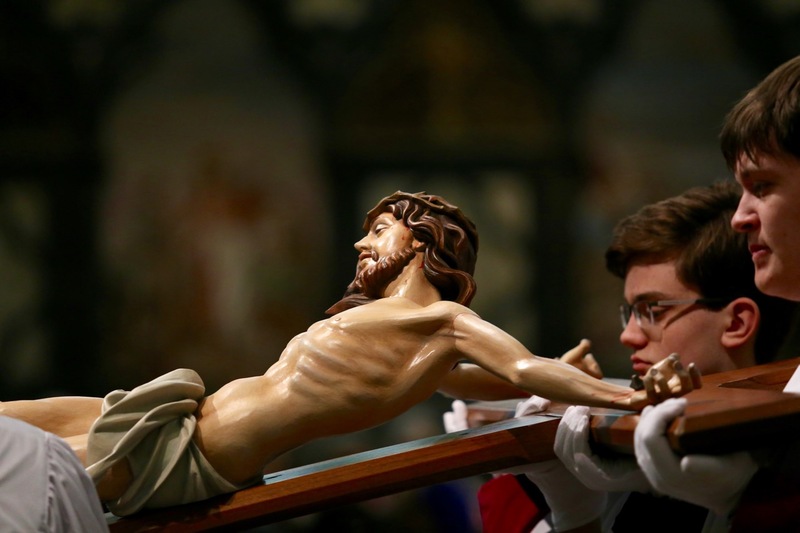 “Over 1,000 people gathered for that Mass and there’s a real reverence about it. Bishop Foys explained that by Saturday morning he and Curia staff were beginning to receive calls and e-mails from news stations and people from all over the world commenting about the confrontation in Washington. By Sunday morning the diocesan website was receiving over 200 thousand hits per hour and e-mails were coming in at a rate of over 10,000 an hour — crashing servers. Staff phones rang persistently for days — cell phones and office phones — until voicemail boxes were full; calls from media seeking a statement, or comments from individuals all over the world criticizing either the students for their behavior or the diocese for their lack of support. Bishop Foys went on to summarize the situation that he, Mr. Rowe, the students, the Covington Catholic community and the diocese are now facing and about the investigation being done. “This is a no-win situation. We are not going to win. No matter what we say, one way or another, there are going to be people who are going to argue about it, people who will try to get into people’s heads and say, ‘This is what he meant. This is what they meant when they were doing this and doing that.’ The best we can do is, first of all, to find out the truth, to find out what really went on, what really happened. So we do have investigators who are here today, a third-party who are not associated with our diocese, not associated with me or with the school, who are working on this investigation to find out what happened. “I am the shepherd of this Church. I have to present not only to the people of our diocese but also to the world the facts. Not the facts that someone has imagined or the facts that someone thinks or facts that people might determine from seeing a video. I encourage all of you, especially the students who were there at the march, to cooperate with the investigators. This is with the permission of your parents. We’re not going to have you do anything without the permission of your parents. And the teachers and chaperones who were there, I am asking you, too, to be cooperative with this. “Father Michael Hennigen (school chaplain) has said that ‘The truth will set us free.’ That’s true. It is my fond hope, it is my prayer, that when the truth comes out you and I and the diocese will be exonerated. But I need something to present to God’s people and say, ‘Look! Here are the objective facts.’ This investigation isn’t going to be over overnight — it can’t be if it’s going to be thorough. “Some people’s lives, as you know, have been affected for the rest of their lives and the honor of our school has been tainted. We have received, and probably you have received, horrible, vile e-mails. This brings out the worst in people. “We have to ask ourselves, what are we going to learn from this? One of the things I hope we’ve learned, I hope you’ve learned, is that perception can become reality. A person can be doing something that is absolutely innocent but if he gives the slightest hint, the slightest perception, that this is something wrong that is what people are going to remember, and then for them that becomes their reality. In closing he reminded the students how much he supports Catholic education and CCHS in particular. “Anybody who knows me knows that I support Catholic education. Over the last 17 years I have come to Covington Catholic a number of times each year. I always open your school year with Mass and I celebrate with you your successes. It pains me, more than you can imagine, having to be here today; but we can get over this. I’m 73 years old, I have faced a lot of struggles and hardships — we will get over this, there will be time to heal, it will be all right. But in the meantime preserve the integrity of the school, be the best that you can be and lay off the social media for a while. The Thomas More College Board of Trustees announced Sept. 28 that the college would officially become Thomas More University effective Oct. 1. Kentucky’s Council on Postsecondary Education formally granted university status to the college in July. While full implementation of Thomas More’s name change will take place over the coming 2018-2019 academic year, the college rolled out its new identity at the end of last week, wrapping up a weeklong series of events commemorating the 50th anniversary of the Crestview Hills campus dedication. The new university designation celebrates the evolution and success of the college, and it positions Thomas More to leverage its expanding academic offerings, including new graduate programs in ethical leadership studies and athletic training, as well as an array of online programs. The transition to university will necessitate a new organizational structure by creating three distinct colleges and one new institute: College of Arts and Sciences, College of Business, College of Education and Health Sciences, and Institute for Ethical Leadership and Interdisciplinary Studies. The college’s breadth of academic programs has been enriched by recent growth in its physical facilities. This fall, Thomas More will open a new residence hall on its campus, a new STEM Outreach Center at its Biology Field Station on the Ohio River, and it will further expand its campus footprint with the new Center for Health Sciences (in partnership with St. Elizabeth Healthcare) and a Performing Arts Laboratory, both located in Edgewood within walking distance of the campus core. The college has also witnessed significant growth in its endowment, donor contributions, co-curricular programs and enrollment — welcoming the largest incoming class in the school’s history this fall. A Pennsylvania Grand Jury released, Tuesday, Aug. 14, 2018, a report detailing the names of 301 priests who sexually abused over 1,000 minors over a 70-year period in that State. This report, coupled with the recent revelations regarding the former Cardinal Theodore McCarrick and seminaries in Boston, Mass., and Lincoln, Neb., has shocked and angered God’s people, including myself. These revelations call to mind for me, as I am sure it does for many of you, 16 years ago when we, in the Diocese of Covington, faced a similar crisis. It was an extremely difficult time for us as a Diocese — for our people, for our priests, for me and most especially for the victims of sexual abuse. Meeting individually with over 200 victims and survivors of child sexual abuse by priests changed my life. I have seen the pain in their eyes and in many instances shared their tears from their experiences. Their pain lives in my heart and impacts every decision I make in my quest to protect children and vulnerable adults. I will carry their pain with me to the Bishops’ Conference in November as we again discuss the concrete changes that need to occur within the governance of the Church to better address the sin of sexual abuse within the Church. Let us begin by placing ourselves in Christ’s hands. Please join me in praying for the victims of child sexual abuse by clergy, that they may find peace and healing in the arms of Christ. Pray also for the good and faithful priests who, with me, are humiliated and disheartened by the sins of their brother priests, that they may continue to live faithful lives in the example of Christ. Christ, alone, suffered death on the Cross to redeem us from our sins. Now, Jesus, we place our trust in You.